Old Road was the very first British town in the entire Caribbean.Sir Thomas Warner landed at Old Road Bay on January 28th 1623 with fifteen others settlers. He was met by the Carib Chief, Tegreman. The Indians had their village and ritual grounds in this area. The settlers were at first on good terms with the island's Carib inhabitants, though such friendship lasted only a very few years. Rather than cultivating sugar, it was tobacco that had drawn Warner to the island, and it was the island's tobacco crop that first supported the settlement. 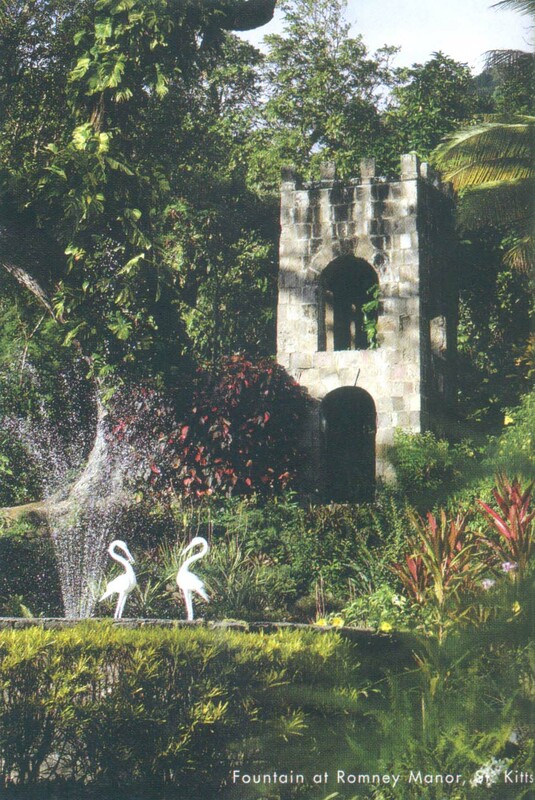 The Warner family estate served as the capital of St. Kitts until 1727, when it was moved to Basseterre. 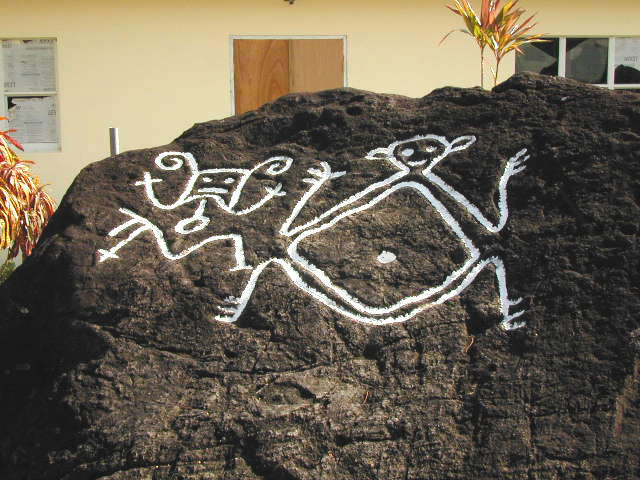 Outside of Old Road bay are found a number of interesting Carib petroglyphs. This 17th-century Great House and plantation is surrounded by five (5) acres of gardens filled with exotic flowers, terraces, a croquet lawn, an old bell tower and enormous 350-years-old Saman “rain” tree. The Manor is also home of Caribelle Batik, where local artists use the ancient Indonesian art of batik to create St. Kitts' colourful fabric, fashions, and wall hangings. A childhood friend of Sir Thomas Warner, Samuel Jefferson, a great-great-grand-father of the American statesman, was given a thousand-acre land grant for a property named Wingfield Estate. This was the only estate to used a water wheel for power and the remnants of the brick aqueduct still stand some distance up the road. The Romney Family later leased this land and today it is home of the Caribelle Batik and The Batanical Gardens of Romney Manor. Artisans at the Batik factory provide live demonstrations of the complicated process of turning soft Sea Island cotton into colourful batiks. The beautifully restored gardens surrounding the 17th Century sugar estate feature a magnificent old Saman tree that requires a wide-angle lens to photograph. The historic garden at Romney Manor have been restored and expanded by its owner, Maurice Widdowson. Since the 1970s when Widdowson first found Romney and subsequently purchased it, he has been working on various phases of the garden. 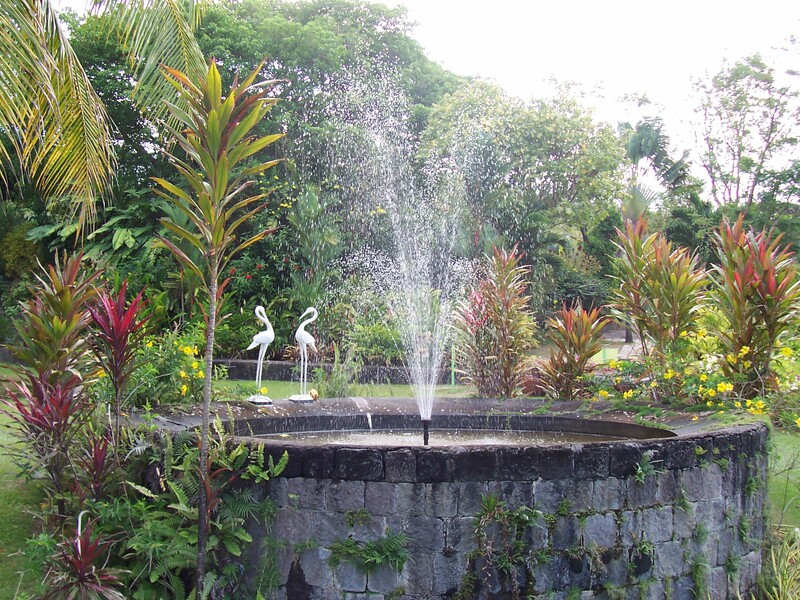 Today, the mansion, where Caribelle Batik’s artisans work and the batik clothes are sold, is a counterpoint to the lush, topical gardens. When Widdowson took over the property, “it was very, very overgrown and had a look of abandonment about it. “Now, 20 years later, the property shows the effects of loving care. The Romney Manor property, along with the Wingfield Estate next door, which Widdowson also owns, is about 12 acres. Besides the many trees and plants that arranged identified at Romney, here is natural rain forest surrounding the area. One of the most magical walks on St. Kitts, not found anywhere else in the Caribbean, is the path between Wingfield and Romney, up a hill and through the rain forest. It is short, but oh so sweet. The late 1990s were a tough time at Romney. A fire destroyed much of the wooden great house, and hurricanes and the mealy bug took a heavy toll on the gardens. But this “blessing in disguise,” as Widdowson call it, ended up with a better great house, and a garden full of heartier plants arranged and identified more as a true botanical garden. Was the home of Carib Chief Tegrem an and his followers. This tribe befriended Thomas Warner and his group in 1623 and permitted them to settle on St. Kitts. At Stone Fort River, the site where over 2,000 Carib Indians were massacred by combined British and French forces in 1626. A short walk takes you to see the pictographs, evidence left by the indigenous people- the Carib Indians of their way life. A sign in this area indicates that you are at Bloody Point and Bloody River. in this canyon and ravine. In the 2000, during CARIFESTA, a international Caribbean Festival of the Arts, a cleansing ceremony was held by the Dominican Carib Chief to release the sprits of his dead ancestors. Participants included Carib descendants from Dominica, Surinam, Belize and Guyana. Charles Fort at Cleverly Hill in SandyPoint, was built in 1672 in commemoration of King Charles -- was once the scene of a battle between the English and the French, who at that time were living side by side on the island. The conflict started whe n the English crossed the boundary and finding themselves the stronger of the two, seized whatever land they wanted, and in addition forbade Duroissey and D'Esnambuc from fortifying Fig Tree, Sandy Point. D'Esnambuc irritated by the violation of the early treaty, returned to France for help from Richelieu. Richelieu supported D'Esnambuc by fitting out a squadron of ten ships which attacked five English ships at anchor, sheltering under the guns of Charles Fort - and without further notice proceeded to pound the broadsides of the English ships. The English opened fire from Charles Fort in an endeavour to protect their ships and themselves from surrender. The French with their superior fire power closed in on the English enemy to within a distance of some two to three hundred feet from the shore, and there they continued to blast at each other for some time, until the English fire slackened. The French closed in further until they were able to board five English ships although the shore battery of the English had not been completely silenced. They were thus able to cut out four out of the five English ships while under fire retreating with their prizes, back in the direction of Basseterre. On the following day, Mr. Payne, Governor Warner's brother-in-law went to Basseterre in a Frigate with a flag of truce. After much negotiation, the articles of a new Treaty signed on the 7th August, 1629, allowed for the return of the four ships to the English and the restoration of the lands encroached upon by the English. Charles Fort was converted into a leper asylum in 1890 and at this time changed its name to Hansen House. The fort walls are largely intact and for most part in good repair. The front wall is in fine shape, standing about 25 feet high. The sea walls have crumbled. Inside an old power magazine is intact, and many of the wooden houses used by the residents have been built on the stone foundations. The fort would be an excellent site for restoration. 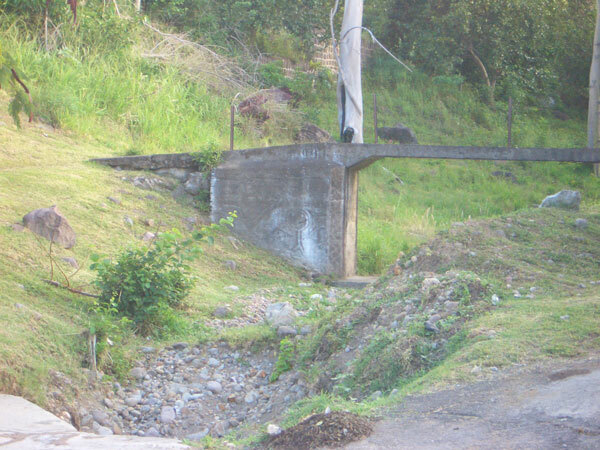 At 4 o’clock December 22, 1989, the South east Peninsular road was official opened. 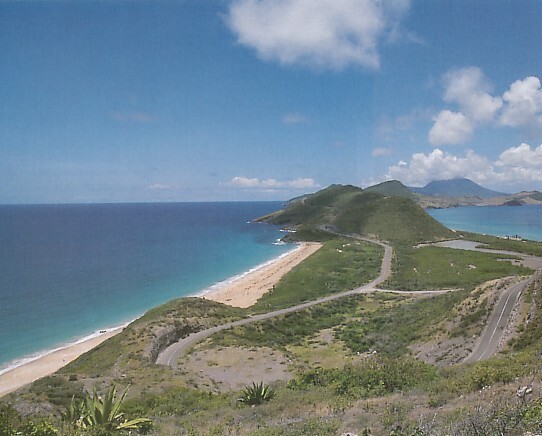 The 6.3-miles, two-lane scenic highway leads from Timothy Hill in Frigate Bay to Major’s Bay at the tip of the Southeast Peninsula only two miles from Nevis. the area was designated a conservation area prohibiting the hunting and killing of wild animals and birds. An enthusiastic crowd of proud nationals and visitors journeyed to Frigate Bay to participate in the opening ceremony which culminated in the cutting of the ribbon by Lady Arrindell. Sir Clement and Lady Arrindell then took the first drive on the the highway. 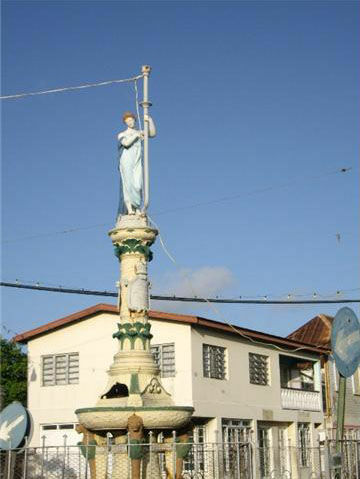 Dedicated to the memory of Queen Victoria erected by the people of St. Kitts A.D. 1902, is engraved on the monument erected in her memory at the round-a-bout at Baker’s Corner. Its original home was at the round-a-bout near the Cardin Home but was relocated to its present site in the late 1960’s. Spooner’s Estate is located east of the town of Cayon. The site, which affords fine views of the surrounding countryside, is rich in agro-industrial history spanning both the sugar and cotton periods, and contains the only surviving cotton ginnery on the island. Little archival evidence of the estate’s early history has survived to this day. However a map drawn in 1753 identifies Spooner’s Estate by name and indicates an animal-driven sugar mill in operation. Later records show that Benjamin Buck Greene converted the estate to steam-powered milling in the 1870’s. 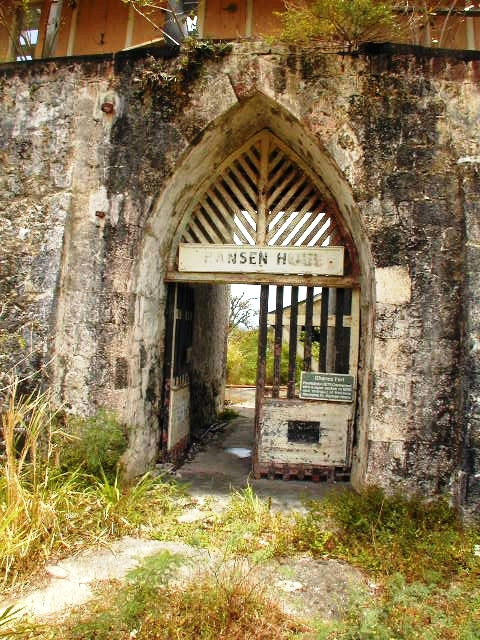 Around 1900, its ownership changed hands, Sendall and Wade, the new owners, became among the first planters in the Caribbean to successfully change from sugar to cotton. 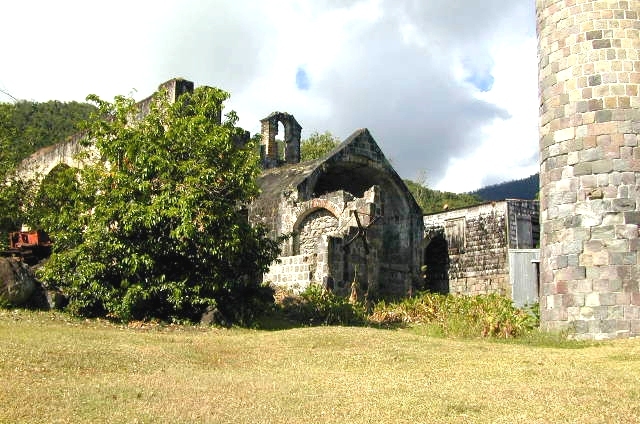 In 1901, they installed the first ginnery on St. Kitts. 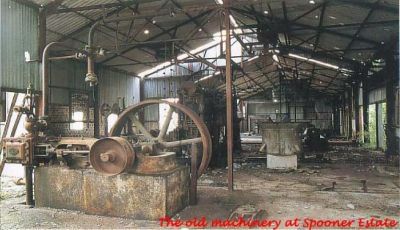 Spooner’s Ginnery continued to operate until 1970’s when the Government of St. Kitts and Nevis acquired the property. 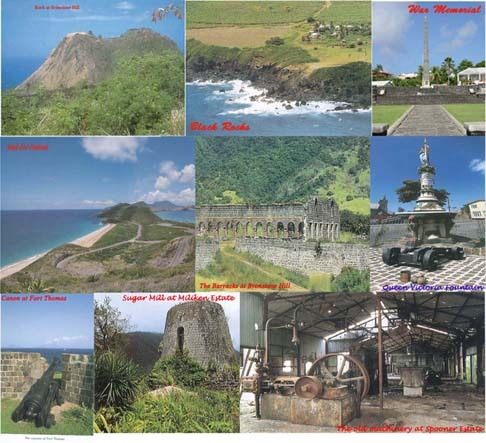 What remains today are structure and ruins from the eighteenth, nineteenth and twentieth centuries representing three major periods in the agro-industrial history of St. Kitts and Nevis. Today, there have been 26 visitors (44 hits) on this page!